The NFL is fickle and you only need to look at Nick Foles (and the Nick Foles rookie cards) to see that firsthand. The traveling quarterback went from young star to overrated QB to Super Bowl MVP in just a few years. Needless to say, his rookie card trajectory has been a rollercoaster, as a result. While the thrilling Super Bowl LII win over the New England Patriots is very likely the peak for interest and values, Foles has shown enough talent to give collectors optimism for continued success with the Eagles or some other NFL team in the future. 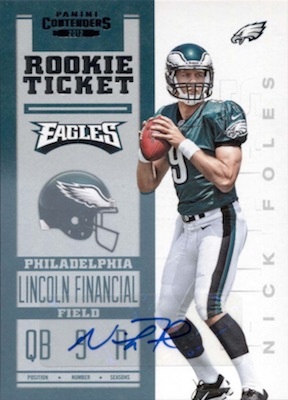 Debuting in 2012 football products, Nick Foles rookie cards were initially lost in the hoopla surrounding Andrew Luck and Robert Griffin III. Although his breakout in 2013 caught the attention of collectors, that appeared to be fool's gold as he bounced around to other teams before rejoining the Eagles in 2017. The backup to new franchise savior Carson Wentz, Foles got his second shot as the starter in Philly due solely to injury, and he carried the team to their first Super Bowl win, besting the legendary Tom Brady. Featuring many Topps and Panini brands, the Nick Foles rookie card checklist is not short on choices. This worked out especially well for Super Bowl LII since the Nick Foles rookie cards are for the Eagles. The list below highlights some of the best releases from his rookie campaign. You can also review a real-time look at the Nick Foles auction listings with the most bids on eBay. Shop for individual cards on eBay by clicking card titles or images. Linked sets go to full product profiles. 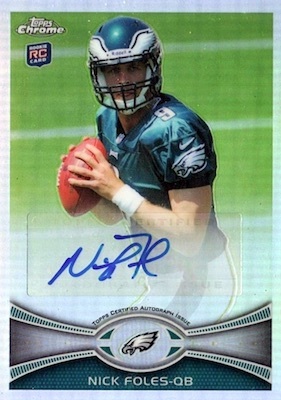 A key Nick Foles rookie card even with the sticker autograph, the 2012 Contenders release benefits from the long-running popularity for the Rookie Ticket line. Although they are normally hard-signed, Foles' card interest has not suffered much. That includes his base version, with the all-white uniform, and the variation with Foles in the Eagles' signature green. Although neither base edition is numbered, Panini revealed that the white jersey card has 550 copies, and the green jersey variation is limited to just 200. 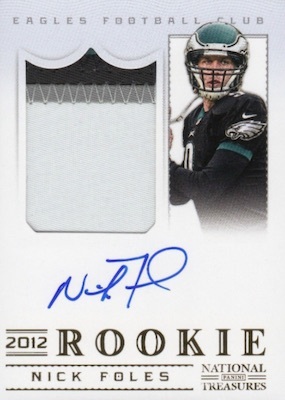 Easily the top Nick Foles rookie card, at least when you exclude parallels, 2012 National Treasures uses the standard NT formula of an on-card signature, jumbo patch and low print run to great success. 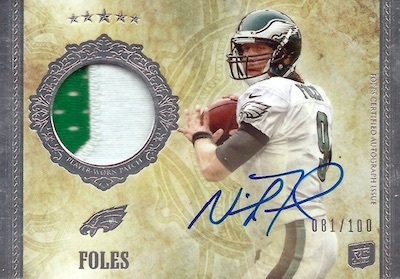 With only 99 copies, supply might be an issue, but Foles has multiple autographs in the high-end brand, including a Rookie Jumbo patch autograph booklet. Much more plentiful and reasonably priced than the other autographs on the list, the 2012 Topps Chrome option is still nothing to look down on. 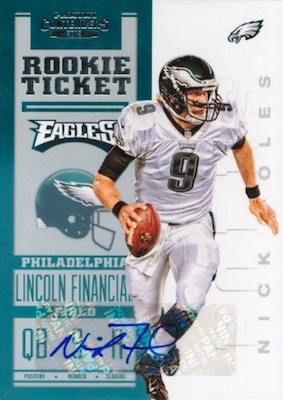 Foles is shown in the middle of a throw on his base rookie autograph. This hard-signed version comes in several different parallel tiers, as well. The base Refractor, numbered to 178, is shown, plus there are even more low-numbered options for a premium chase. Below that is the much more rare Nick Foles rookie variation as he surveys the field, but this time Topps went with a sticker. 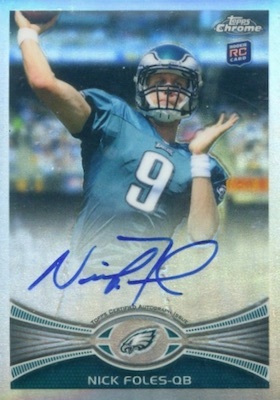 Another premium choice, the Nick Foles rookie in 2012 Topps Five Star is also quite rare. While print runs in the rookie subset varied from 300 to 50, Foles is on the less common side with 100 copies. If you can't locate this one, Foles also signed for many of the Futures inserts, which include inscriptions and booklets. Perhaps you have an affinity for Foles' college days at the University of Arizona. 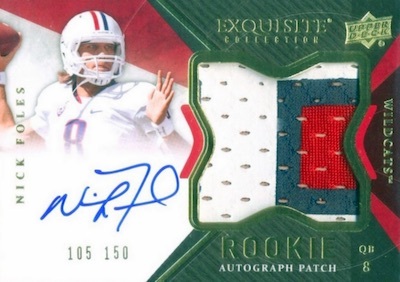 If so, 2012 Exquisite Collection provides the goods with a Rookie Autograph Patch subset. Foles is in Tier 1, putting his print run at 150 in comparison to the Tier 2 production of 99.